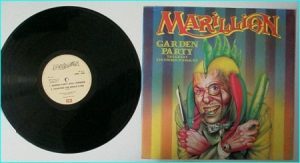 MARILLION: Garden Party [Garden Party (Full Version), Charting the Single (Live), Margaret (Live)Both Charting the Single + Margaret are exclusive songs to this release] “”Garden Party (The Great Cucumber Massacre)”” was the third single Marillion debut album Script for a Jester Tear, reaching number 16 in the UK Singles Chart in 1983, the band biggest … Continue reading MARILLION: Garden Party 12″ includes 2 exclusive songs, both Live versions. 1983 UK. 26 minutes of great Prog. Check videos.